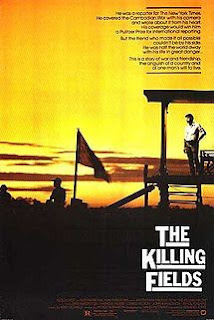 The Killing Fields (1984) is set in Year Zero of Pol Pot's genocidal cleansing campaign in Cambodia. The movie tells the story of an American reporter for The New York Times, Sydney Schanberg (played by Sam Waterson), who travels to Cambodia in the early 1970s to report on the effects of the Vietnam War and US military action in the country. In the capital city of Phnom Penh, Sydney is helped by his translator, the Cambodian journalist, Dith Pran (played by Haing S. Ngor). The journalists realise too late that Cambodia is on the brink of a 'bloodbath'. In the end, Pol Pot's regime would kill 1.5 to 2 million people; as detailed in IntLawGrrls' Khmer Rouge accountability series, efforts to bring surviving leaders of that regime continue to this day. The first half of the movie (at 141 minutes' running time, it is long) centres on the build-up to the arrival of the Khmer Rouge in the capital and the evacuation of civilians. During this time, Sydney ensures that Pran's family are flown to safety by the US military, but convinces Pran to stay. Pran, however, is not allowed to remain with the foreign journalists and is consequently captured by the Khmer Rouge. Notably, the film depicts child soldiers, used as lookouts and killers. We see the children's indoctrination in classes where they are taught that children are separate from their parents and that their only loyalty is to the party. Directed by Roland Joffé, the British film was nominated for seven Academy Awards, including Best Picture, Director, Actor, Supporting Actor, Adapted Screenplay, Film Editing, and Cinematography. It won three – the last two, as well as Best Supporting Actor for Haing S. Ngor. The actor Ngor was, in fact, a doctor who had been held in labour camps for four years in parallel time to his character. This role was his first. Killing Fields is an informative film on the run-up to the Cambodian genocide. The movie clearly highlights US involvement in the region; in particular, the role of then-President Richard M. Nixon in bombing Cambodia and so causing civilian casualties.